The fiery quality of Mars shows up heavily with Mars in the 1st house. You are unstoppable once you put your mind toward doing something. Action is the name of the game, and you’re ready to tackle any challenge head-on. Just be careful not to step on any toes. The effects of Mars in 1st house show that you know how to get things started once an idea pops into your mind. But you hate it when others drag their feet on it (or even seemingly drag their feet). For you the path is obvious and you barrel ahead without any reservations. This is good as long as you’ve thought everything through. Unfortunately that is not your strong suit, and there can be unintended consequences from your actions. Mars is the ruling planet of the first house. The Mars in first house astrology predicts that you try to stay active with numerous different projects. So you’re always working on something new or fresh. This allows you to focus your efforts where you want them to be – in the middle of all the action. You want to be leading the pack, not reacting to something that another person put together. Just make sure to only use your direct nature at appropriate moments. Like when a decision must be made immediately or there is a problem no one else can solve. This is when you are at your best. 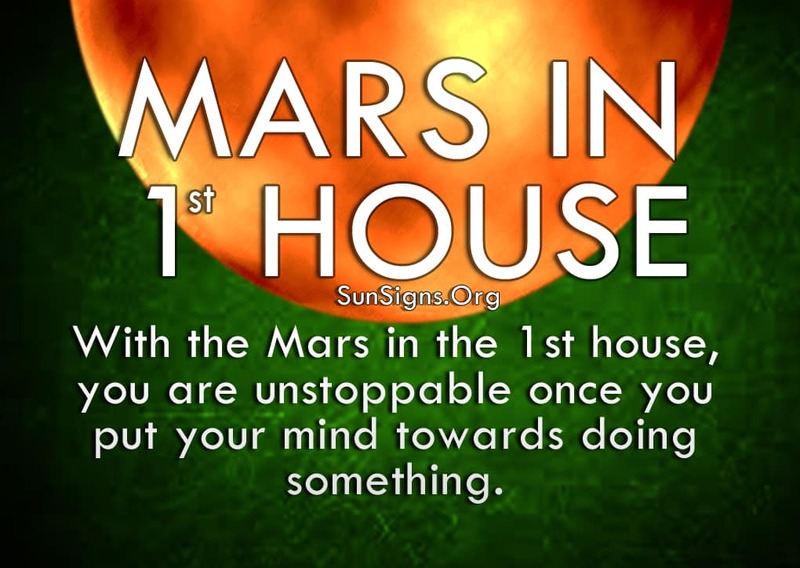 The Mars in 1st house meaning shows that you begin everything with a bold intent and excitement. You often let that dictate your actions, rather than having a solid plan for the future. If you slow down, even just a little bit, you would be able to see past the immediate gratification and determine whether or not you will hit any obstacles. Making rash decisions can be harmful. While the action and adventurous spirit are great assets, they can lead you into trouble if you’re not careful. This is inevitable as Aries is the ruling zodiac sign for this house. This kind of gusto can also be frustrating for other people, as you like to automatically take the lead on something without asking anyone else. If you’re working alone this is not a problem. But if you’re dealing with a group, you will have to learn to take a backseat once in a while to allow others their opinions. Stop rushing and take the time to listen to those who may have different expertise from you. Their knowledge may help to further your plan more efficiently and avoid potential pitfalls that you didn’t account for. This will also help you to avoid being labeled a bully, as your bravado can be overwhelming to some. Because you are so direct and sure in your convictions, you tend to express yourself in an overly confident, sometimes brash manner. And anyone who tries to argue with you gets brushed aside for getting in your way. While Mars in the 1st house person is fiercely independent, you can’t rely on your skill set alone. It’s easier to get into trouble by yourself. Learn to rely on the patience of others to keep you from going too far too fast. Besides, staying in it for the long haul is also not one of your stronger personality traits, so you often need someone else to complete the task you started. You thrive on spontaneity and the thrill of a new project, but once you get into something you get bored and crave that excitement. This can lead to irrational or reckless behavior, as you only care about keeping things interesting.